Before we get into the big secret, I need to let you know one little thing. This mulled wine needs to be left to sit for five days. Sure, you can drink it as soon as you make it (in which case it’ll only take you 30 mins to make) but it’s a million times better if you leave it for the full five days. 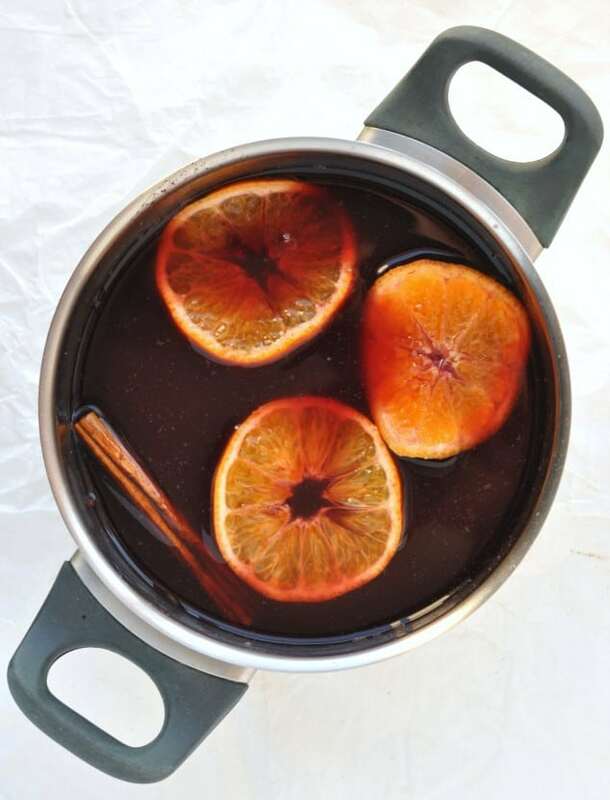 This gives the rich flavours of red wine, cinnamon and citrus plenty of time to infuse and develop, resulting in what really is the best mulled wine recipe ever. So now we’ve got that out of the way, I’d better spill the beans, right? Okay, here we go. My secret to making the best mulled wine is caramelisation. I caramelise the sugar with the spices before I add the wine to the pan. Simple, right? Caramelising the sugar not only adds a slight caramel flavour, but it also helps bring out the aromas of the spices. While we’re talking about spices, I only use 2 – cinnamon and nutmeg. I’ve found that these are the 2 spices that people really love. My boyfriend Some people can be a bit funny about cloves and star anise. 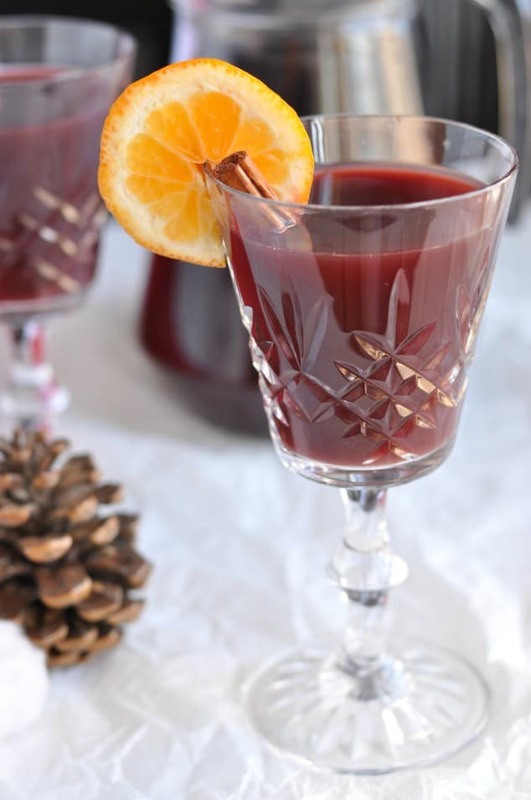 So if you want a delicious mulled wine recipe that everyone will love, this is it. In the baking world, there’s kinda a big debate on caramelisation. Do you stir the brown sugar? Or do you swirl it? If you watch The Great British Bake Off, you’ll know this can seriously divide people! In this recipe at least, it doesn’t matter. Do whichever you prefer. As long as you don’t burn the sugar, you’re good to go. A lot of the alcohol evaporates during the cooking process, so this mulled wine recipe isn’t that strong. If you want something with a bit of a kick (for example, if you’ve got family round this Christmas!) 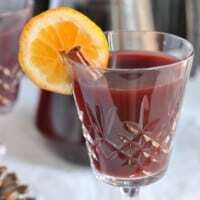 you want my vodka-spiked mulled wine recipe. That stuff will put a smile on your face, no matter how family festive arguments you’ve had! I always find that drinking Christmas drinks out of special glasses just makes everything feel a bit more magical, you know? So while you’re treating family and friends to a couple of glasses of the best mulled wine recipe, why not treat yourself to a new set of fancy glasswear? Here are a couple of sets I love! P.S. Are you a stirrer or a swirler? Let me know in the comments! 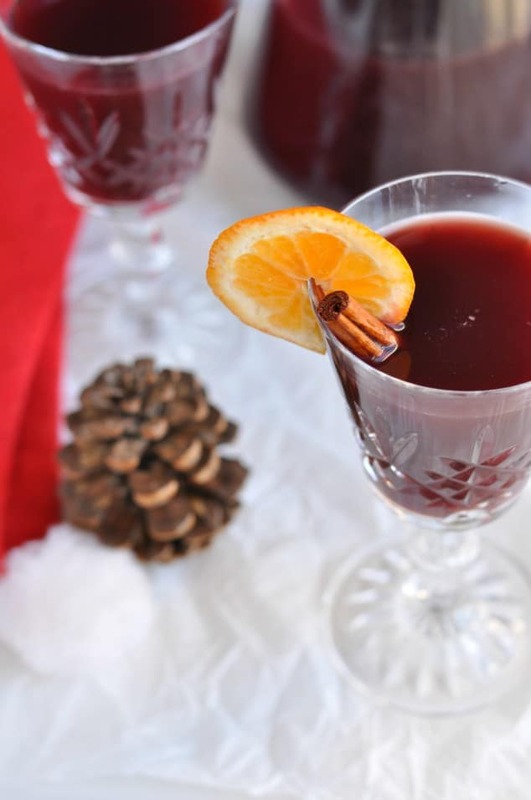 Learn my secret to making the best mulled wine recipe ever! The secret step is really simple, but it adds an incredible boost of flavour. Everyone will want to know how you made it! Place the sugar, cinnamon stick and grated nutmeg into a large saucepan over a medium-low heat. Watch over the pan until the sugar begins to melt (around 5 minutes). At this point, use a metal spoon to stir the sugar so it melts evenly. When the sugar is fully melted, pour in the red wine. The sugar will harden, but this is fine. Continue stirring, scraping the spoon along the bottom of the pan to remove the hardened sugar. When all the sugar has separated from the bottom of the pan, add the orange juice, grapefruit juice and orange slices into the saucepan. Leave over a medium-low heat for a further 20 minutes to allow the flavours to become bolder and the sugar to dissolve. Sieve the mulled wine into a jug (optional: add the orange slices back into the jug) and leave to cool to room temperature. When cooled, cover the jug's opening with some plastic wrap and leave to stand for 5 days before serving. I have never made mulled wine. Your recipe sounds very good. What type of red wine do you suggest and do you refrigerate it for the 5 days or leave at room temperature? Thanks so much, Patty! Apart from mulled wine and sangria, I don’t drink red wine at all and I know nothing about it! But I can tell you that I use the cheapest of the cheap stuff (literally €0.99 a bottle!) and it tastes amazing. I also leave it to sit at room temperature for the 5 days. thanks so much for stopping by and I hope you love this mulled wine as much as we do. Good questions Patty, I also had them. Hi Brian, thanks so much for stopping by! I just answered Patty’s questions are here are my answers: Apart from mulled wine and sangria, I don’t drink red wine at all and I know nothing about it! But I can tell you that I use the cheapest of the cheap stuff (literally €0.99 a bottle!) and it tastes amazing. I also leave it to sit at room temperature for the 5 days. How long will it last once it has set the 5 days? Can it be refrigerated and then a cup heated up as needed? Do you suggest sweet red wine? Cuz mine is sweet and I’m sure it affects the amount of sugar.